Materials were gathered and donated by committee chair Shirley Barnett. 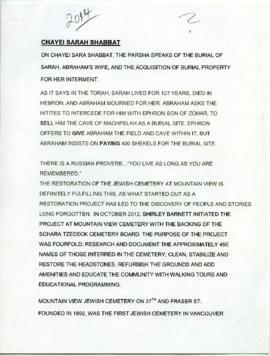 The fonds consists of correspondence, meeting minutes, financial records, newspaper clippings, and photographs from the Mountain View Cemetery Restoration Committee (under the Schara Tzedeck Cemetery Board). The fonds includes extensive records of all Jewish families buried in the cemetery, including pictures of their gravestones before and after being restored, family trees, and copies of birth, immigration, marriage, and death certificates when available. Material is in good condition. Contains many photocopies that will not be digitized. Some files restricted for privacy, please contact archivist.